Burnt Orange paper shopping bags possess a strong contemporary take on the color orange which allow them to be the obvious choice for a contemporary sophisticated choice for packaging. 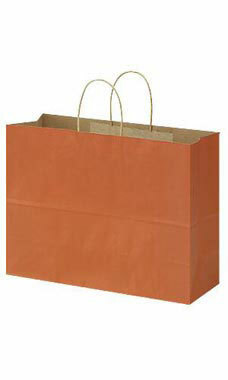 Reminiscent of pumpkin pie these bags are an excellent choice for fall seasonal retail packaging options and crafting. A versatile product, this mid size bag can be used in a variety of ways ranging from retail apparel to handbags.